I get a lot of questions about putting Variable Frequency Drives (VFDs) on belt grinders. By the nature of the questions I receive, I thought some background info would be in order. This information is not intended to replace the experience of a qualified electrician, rather it is an aid to those wishing to understand better what it takes to get the right VFD and motor on your grinder. I'll try to keep this as layperson friendly as possible. First some background information. I'll start with single phase power, because it's likely what we have at home. When someone asks me "Can I put a VFD on my grinder?" "Do you have 240 in your shop?" Sometimes people know what that is, other times I get a blank stare. So let's look at single-phase electric supply and why 240 Volts is going to be important for running a VFD on your grinder. Let's get back up the pole. You've probably seen a pole mounted transformer like this or a transformer that's like a big humming steel block mounted on a concrete pad. That one in front of the neighbor's yard? These transformers reduce the voltage down from high voltage to a voltage that can be used by the consumers. They are called step-down transformers. 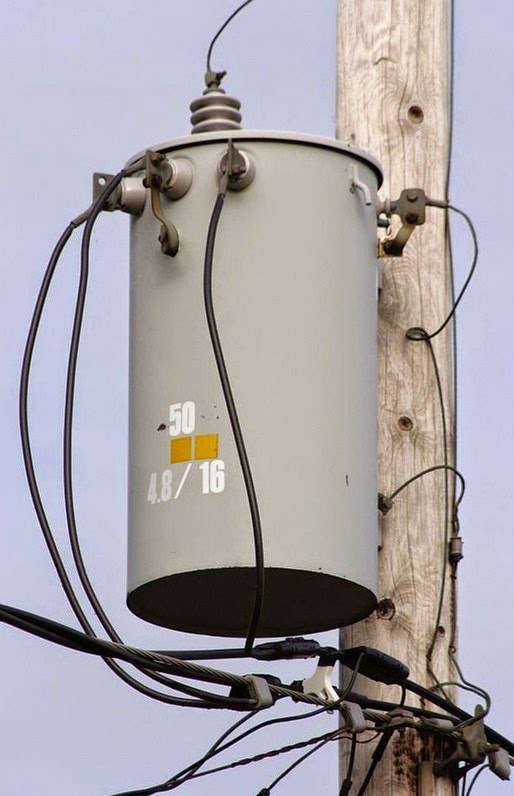 In the pole mounted transformer in the picture, there is a SINGLE wire coming in the top. This wire is a single-phase of a three-phase electrical system. That's why we call the power we get from the transformer "single-phase". Here is a schematic representation of the step-down transformer. Single-phase electric supply is common in residential areas. It's called "single-phase" because the power that feeds your home or garage comes from a single phase of a large transformer that supplies your house or possibly several houses in your neighborhood. In some areas this setup is known as split-phase. The high voltage is reduced to a 240 V "service" for our homes. This consists of three wires that bring the power into the meter and then our homes. The transformer shown has three wires on the output. One black, one red and one white in the centre. The image here shows two waves, one red and one black, that are 180° out or opposite to each other. If your garage or shop has its own breaker panel, you probably have a 240 Volt single phase supply. This is the typical panel that I have superimposed some colored lines to show how the two hots (red and black) are used with respect to the neutral (white) and each other. Let's take a look at some basic circuits so we can speak-the-speak with your electrician. In 120 V circuits, the current flows between the hot (black) and neutral (white) wires. The green wire is a connection to ground and never carries any current, unless there is a fault. In North America, 120 V circuits are commonly limited to 15 to 20 A (Amperes). A 15 A circuit is capable of supplying 1850 W (Watts) of power and a 20 A circuit can supply 2400 W of power. Most small single-phase motors -- up to a couple of horsepower, can run on these types of circuits. A small utility heater may use 1500 Watts, so it pretty much uses a whole 15 A circuit's capacity by itself. OK, in all fairness there are some VFDs that take 120 V and boost it to 240 V. These are generally limited to about 1.5 horsepower and this may be fine for some folks. However, having 240 V to plug into will get you a 2 or 3 or 5 horsepower motor if you wish. The 240V is actually two 120V lines that are used together to make 240V, one is shown as red and the other is black. Your clothes dryer, oven and other heaters and large appliances such as an electric hot water heater require 240V. In a workshop setting, a three wire 240 V circuit would be handy for a welder. This would also work for a VFD on a grinder. Huh? There is no neutral wire? Yes there is only 240 V here, no 120 V.
Some appliances, a range or a dryer for instance, may need 240 Volts for the heating elements and 120 Volts for the controls, clock, lamp or motor. The neutral is added to allow the 120 V.
There are more circuits outside the scope of a grinder setup and they are all good to learn about. Head down to your local hardware store or go online to Amazon. I recommend this book for newbies learning about basic electrical for your home and shop. It covers a lot, but it's easy to read an has tons of pictures. Next we will look at what you'll need to power up your VFD in your shop.